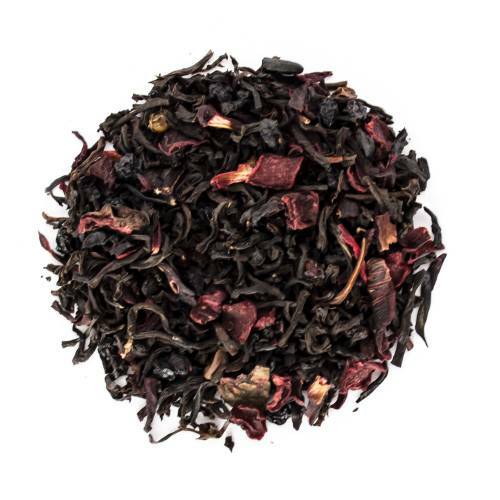 A rich combination of malty black tea, dark berry flavours, tart hibiscus and naturally sweetened by beetroot pieces. What makes this tea an elixir? It's not just a delicious black tea blend. We chose the ingredients specifically for the benefits for health, skin and energy. You often hear about the benefits of green tea or oolong tea, but less frequently hear about black tea. Each variety comes from the same plant, so the benefits are pretty similar from one to another. Black tea is rich in antioxidants, flavonoids, polyphenols, L-theanine and some minerals. The benefits of these compounds are many. Some of the benefits found in black tea are reduced cholesterol, heart health benefits, digestion, reduction in blood pressure, lowers blood sugar, improves skin health, improve focus and concentration, lower stress levels and there are some studies showing even more amazing benefits. Beetroot infused into tea contains antioxidants and nutrients such as iron, folic acid and vitamin C. This can lead to benefits such as clearer skin, softer hair, detoxification, boost iron levels, regulate blood pressure and is great during pregnancy due to folic acid and other nutrients. Elderberries have long been used as a cold and flu tonic, as well as a syrup to deliciously flavour foods and beverages. Elderberries infused in tea provide flavonoids, antioxidants, vitamin A and C. The nutrients in elderberries could help with boosting immunity, helping with cold and flu symptoms, clearing skin, detoxification, boost vision health (thanks to vitamin A), and sooth digestive upset because of it's anti-inflammatory nature. Hibiscus is rich in antioxidants and vitamin C as well as other minerals and vitamins. It has been said to be excellent for lowering blood pressure, decreasing cholesterol, boosting metabolism and burning fat, clearing skin and detoxification as well as boosting immunity. If you've read our post on tea concentrates, you likely already know the drill. A tea concentrate makes enjoying your favourite teas quick and easy. You can prepare your concentrate at the beginning of the week and enjoy for up to 5 days when refrigerated. Add your concentrate to smoothies, water, milk or even oatmeal. • Use 1 tsp of tea per 1 oz of hot water. • Infuse for 2 minutes in boiling water. • After infusing, filter the infusion through a fine mesh strainer. Tip: We also like to filter it a second time through a biodegradable paper coffee filter or clean cloth to get all the fine particles that may lead the tea dust to continue infusing. Refrigerate for up to 5 days. Use 1/2 - 1 tsp of concentrate per serving, according to personal preferences. Have you tried Crimson Elixir? Tell us what you think! These iced tea cocktails are refreshing, light and easy to make. Combining tea and alcohol is not a new concept, but we’re often greeted with surprise when we mention tea cocktails (aka Teatails). Tea is so versatile, there are many flavours available. Iced tea is easy to make. Once you have your iced tea ready, you can use it to make cocktails as usual. Our favourite methods of preparing teatails are either tea concentrates or tea infused alcohol. We suggest you experiment to find the best option. Spring is here, time to break out the iced tea! There are quite a few methods for making iced tea, selecting the right method really depends on the tea leaves or herbs you are using to make the infusion. You can use any kind of tea or herb to make iced tea, but some are a bit more temperamental and require a bit more attention. Over the past years we’ve held quite a few iced tea-making workshops so some of our Ottawa customers are probably already familiar with a lot of these iced tea methods, but in case you need a refresher, read on. This guide is intended to help you figure out which method is best for your tea of choice. At the end of the guide will be some links to Shanti Tea’s Iced Tea Pouches, which will make iced tea-making this summer deliciously effortless.